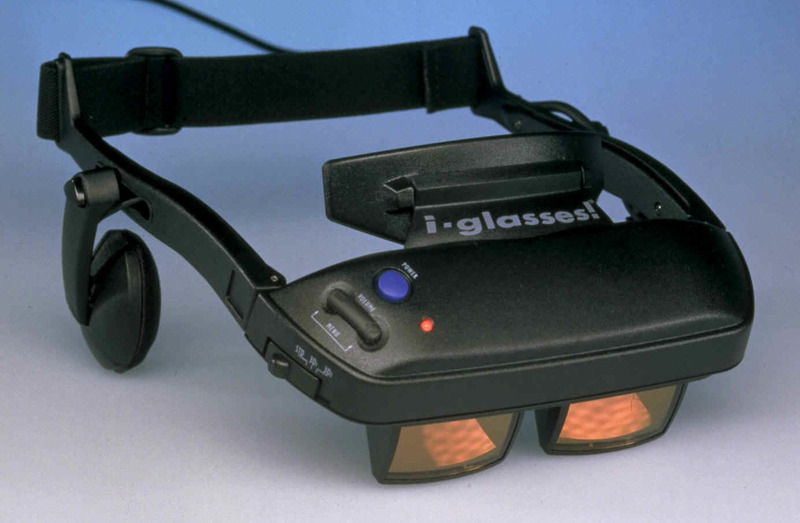 1995 Video of Virtual io’s I-Glasses. Virtual reality Head Mounted Display with headtracking. This was the first i-glasses version released and had much lower resolution than the i-glasses they sell today. Back in 1995 this was one of the first affordable home VR headsets along with the Victormaxx cybermaxx and the fortevr VFX-1. The small and lightweight design made it comfortable to wear, but the enormous cable from the VGA-box to the Computer, the box itself, the cable to the glasses and the power supply rendered it a too large package to really “take everywhere”. They still work fine today, but the maximum input resolution of 640x480 makes a modern Windows Vista Desktop appear a bit crowded. For today’s standards the resolution and color depth are a bit too low to really enjoy watching 3D movies, but astonishingly the recent “Avatar” game by james Cameron works amazingly well and the nice graphics don’t look as bad as you might think on the low res.